Hill’s Restaurant used to be somewhere else and called Hill’s Some Place Else, but that aside, be sure you find the current place for this old time Spokane favorite! Unpretentious inside this place serves up some of the most reasonably priced and tasty food in Spokane. 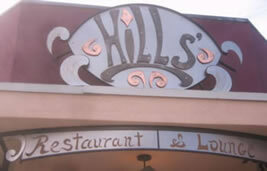 Delighting Spokane diners since 1993, Hill’s is family owned with one brother in the kitchen and one behind the bar. The exposed brick walls and wood furnishings have a simple open feeling that complement the down-home, well prepared meals that swing out of the thoroughly modern kitchen. Start your Hill’s cuisine experience with a Scotch egg appetizer or terrine of the day, and for lunch don’t miss the best Ruben around. A nice selection of sandwiches, burgers and salads will satisfy any hunger urges. Even the chips are hand made from local potatoes. Dinner entrees shine at this place. You might chose from the Chicken laced with Pancetta & Brie or the Cashew Crusted Chicken Breast. Like steak? 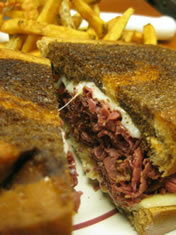 Hill’s serves Brandt True Natural Beef in a choice of six different cuts. Now top that with one of the 14 freshly made sauces that are offered on the menu. Can’t decide which sauce…the rich Gorgonzola, the creamy Béarnaise or the reduction Wine? Ask Dave the chef for his recommendation…he made them all! Several fresh fish entrees round out the menu and there is always a tasty rendition with tofu for the meatless minded. Save room for desert as they are home made too. A rooftop garden in the summer provides some of the freshest lettuce, Heirloom tomatoes and accompanying herbs that can be found on a Spokane salad plate. Down the stairs, through the kitchen and out to your table! 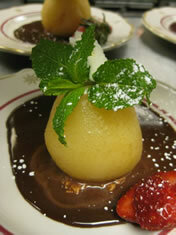 Hill’s offers a simple but elegant Private Dining Room able to accommodate parties up to 16 people. 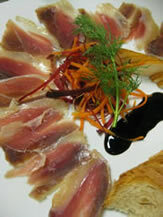 The menu to be served can be customized to your taste. The bar at the back is a favorite watering hole for a variety of Spokanites with new comers always welcome. Spokane is glad Hill’s is not “some place else” but deliciously close to right downtown!